After all the research is done for a family and your status family group record is as complete as you can make it, it is time to type up a final, documented copy of the family group record. It should be easy to determine which sources you used to obtain your data because it is all neatly filed. 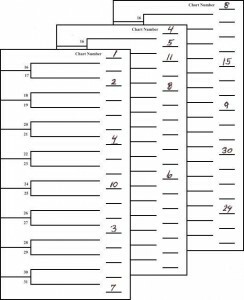 You may wish to place a copy of your documented family group record in the research folder, as well as in your Family Record Book. 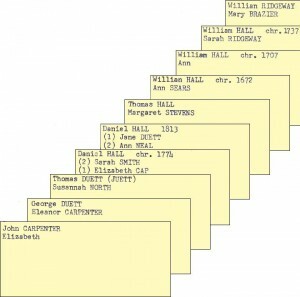 As the number of documented family group records grows, you may wonder how to file them in your Family Record Book. 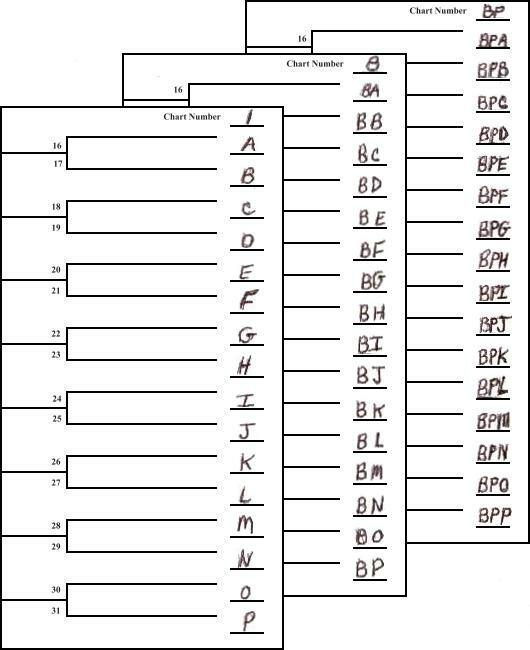 One of the easiest ways is alphabetically: first by the surname of the husband; then, under each surname, by the given name of the husband; and finally, for those who have the same given name and surname, file them chronologically by date of birth. You may want to use this same idea in filing your Family Research Folders. As your research progresses, you will want to keep an accurate up-to-date pedigree chart. A pedigree chart is like a map of your ancestors. Whether you file it in folders or your Family Record Book, by the time you have more than one, you will need to number them in such a way that you can easily turn to the one you desire. There are two main ways of doing this. 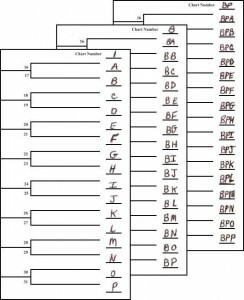 Either can be organized using letters or numbers. The first method is referred to as pre-determined numbering. This means that each line in the last column of a pedigree chart has a definite number or letter assigned to it. The second method is referred to as random numbering. This means that as a line extends off the pedigree chart, it is assigned the next letter or number available. Either of these methods is workable and each has advantages and disadvantages. You must decide which system or combination of systems best fits your needs. 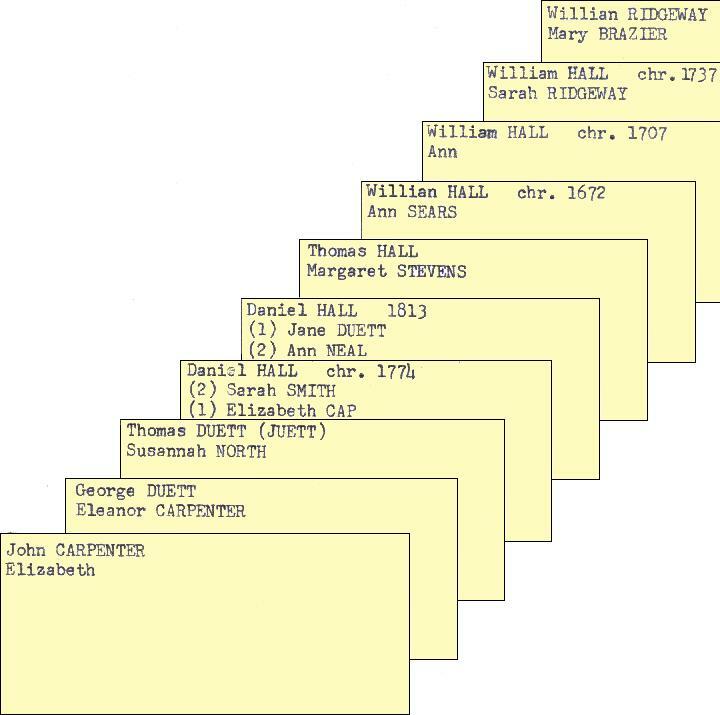 The result of following this filing system will be that you, or someone else, will easily be able to find your genealogical documents and research notes. You will be able to come back to any Family Research Folder a day, a week, a month, or years later and within only a few minutes’ time be able to pick up where you left off and not have to repeat your research.